Formed in 2014, the National Stalking Consortium is a collaboration of organisations working in stalking. Its overall aim is to improve support to victims of stalking throughout the UK. The Consortium is committed to identifying gaps in provision and taking a proactive, coordinated approach to improving stalking services across the statutory and voluntary sectors. It aims to enable more stalking victims to cope with the immediate impact of stalking, and recover from the harm experienced, by campaigning for more holistic support services. The Consortium’s work is informed by the experiences of victims and robust academic research. The Alice Ruggles Trust joined the consortium in 2017. 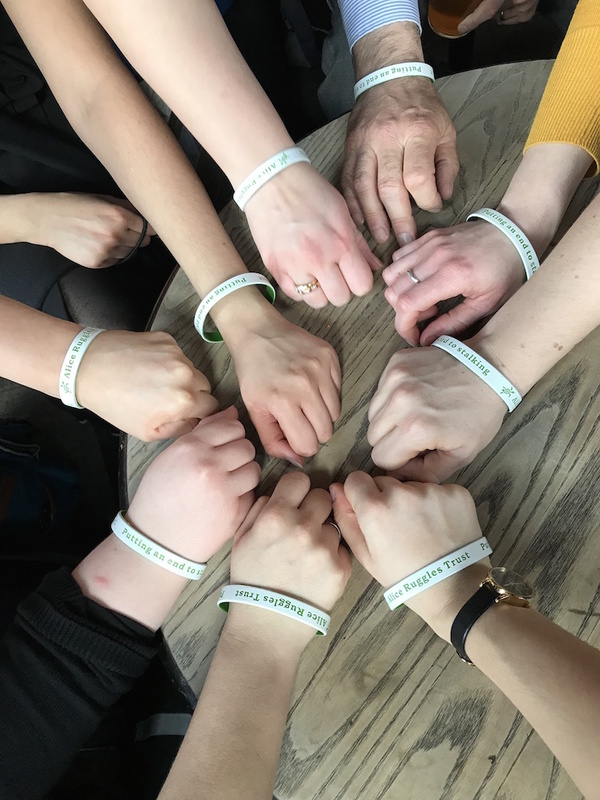 The picture, taken on the first day of National Stalking Awareness Week in April 2018, shows staff of the Suzy Lamplugh Trust together with the Alice Ruggles Trust sporting our Trust wristbands following the launch of the report Out of Sight, Out of Mind—Two Years On.